Backpacking should be easy and efficient. It's not always about looking your best, it's about having the best experiences. But if you're anything like me, you still want to look good for pictures you'll eventually show your family and friends back home. I envy the girls who seem to effortlessly wear red lipstick. When I try, it ends up on my teeth, in my hair and everywhere else it's not supposed to be. But while lipstick is not for me, sometimes it's nice to add some extra color. This is why I love Pacifica's lip tint. It feels just like chapstick and the all-natural ingredients such as coconut and avocado oils make your lips feel smooth and hydrated. I've only tried the Blood Orange, but this rosey-orange shade is perfect for me and adds just enough effortless color. An eye liner pencil is an easy and lightweight tool that can be picked up anywhere; I have no favorite brand. My go-to technique is the "Incognito Eye Definition" I learned here, but using a pencil nstead of the brush. And for nights out, I like to smudge the liner a little like they do here. If you don't have a brush, use a Q-tip.. or your finger! The farm that was my home in Ecuador didn't allow any chemical products to contaminate the water supply, only organic soaps. So before I left The States, I bought Dr. Bronners in bulk. This stuff can be used for anything: soap, shampoo, laundry detergent, toothpaste, fruit/vegetable wash, dish soap.. anything! Also, I love the Tea Tree flavor and it does wonders for my skin. BB stands for "beauty balm" and this cream basically does it all. It moisturizes, illuminates, evens the skin tone and provides an SPF of 15. I've tried a few different BB Creams of the years and this one had become my favorite. One tube lasts forever because a little goes a long way. It took me 10 months to finish my last one, and I use it everyday! It's also great because it provides just enough color to cover any redness or imperfections, but you'll be the only one who knows it's there. Sprinkle it on your scalp and brush through for a cheap alternative to dry shampoo. No shower necessary! Shiny skin? Dust a little on your face before taking pictures! Smelly shoes? Pour some powder into the soles so you won't disgust your hostel roommates. Oil on your clothes? If you had a late night with greasy street food, let baby powder absorb the stain for a few minutes and then wipe it off to save your favorite shirt. Sandy feet? Shake little bit of powder onto your feet and let it absorb any moisture so sand won't stick. …you should be convinced by now. Baby powder has been a go-to staple of mine for many years, but recent studies have shown that the main ingredient, Talcum, is a hazardous chemical. While I'm not willing to give up baby powder in general, I am willing to change to a safer, natural option. Burt's Bees brand powder uses natural cornstarch instead and works just as well. I have a lot of hair and it does whatever it wants. I'm in an ongoing struggle whether to just let it be or try to tame the beast. When traveling, there is no other option than to just let it be free! With wet hair, I'll rub A LITTLE of this moroccan oil on my hands and run them through the strands, concentrating on the ends. This helps to control the frizz and bring out the best curls and waves. 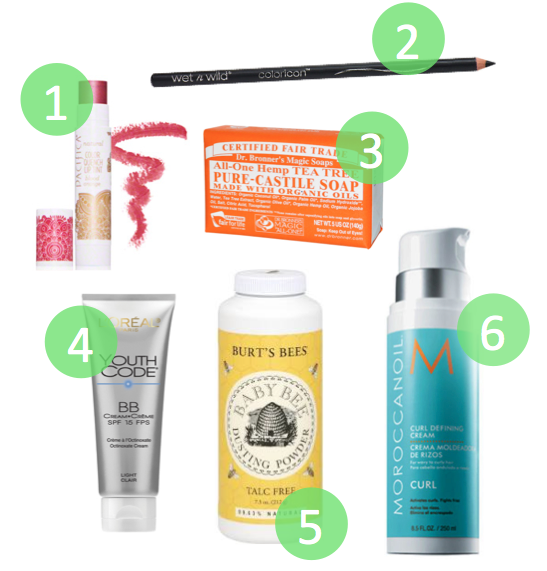 Do you use any of these products or have any other backpacking beauty tips to share? Let me know! ..I'm also curious to hear about more high-maintenance travelers. I've seen you stuffing your big makeup bag into your backpack and hogging the hostel bathroom. How do you do it? Thanks Jen! Dr. Bronners is wonderful.. definitely try it! I also have Burts Bees lip tint in Rose.. but I promise, Pacifica is better! You'd love it. All key products! :) Although I've never tried the Burt's Bees powder.. Do they sell it here? No, I don't think they sell it here, but you may be able to find another talc-free baby powder in a health store. This post is genius. Gosh, I love your blog so much! Also, Moroccan Oil is pretty much the best thing ever to exist in the world of haircare. Have you found a place to buy it here in Madrid? Thanks Courtney :) And yes! I randomly found it at a salon on c/ Jorge Juan. I'd love a post from you about your favorite products, as well!